"In the summer of 1988 I attended a seminar hosted by our state regulator. I was a part-time auditor in my credit union at the time and pretty new to the profession. Three other credit union internal auditors were also in attendance and we all shared information about ourselves. I enjoyed the connection we developed and wondered if there were other credit union internal auditors in Wisconsin. If there were other auditors, could we expand these relationships? After the meeting, I asked my CEO and board of directors for permission to seek other auditors in Wisconsin and Minnesota to establish a credit union organization. They gave me the go-ahead and I sent out letters to credit unions. A meeting to discuss the possibility of organizing a group of credit union internal auditors was held in Eau Claire, Wisconsin in May 1989. Employees from six Wisconsin credit unions and two Minnesota credit unions attended. Officers were elected, and we named ourselves the 'Association of Credit Union Internal Auditors.' A year later, ACUIA incorporated as a nonprofit organization in the state of Wisconsin. State law didn't allow the use of the words ‘credit union’ in a corporation without permission from the credit union regulator at that time. We applied to the Wisconsin Commissioner of Credit Unions for use of the words and they approved our request. The Wisconsin State League carried a short article on our organization's activities in their monthly newsletter. Later, I was interviewed for commentaries in the Credit Union Times and The Credit Union Accountant. The publicity generated interest and soon credit unions from other parts of the country began to call me. The original intention was to recruit members only from the Midwest. It became readily apparent that there was a need for our organization in other parts of the country. We divided the country into regions, assigned regional directors, and turned our attention toward a national organization. In 1990, we had seventeen credit union members and hosted our first local meeting at IBM Mid America Employees FCU (now Think Bank) in Rochester, Minnesota. In the spring of 1991, we decided to hold an annual conference in Bloomington, Minnesota. Because our credit unions had generously supported us financially in the administration of ACUIA, initially we were not going to charge a fee to attend the conference! After further thought, we questioned if participants would be suspicious of a free conference and decided to charge a conference fee of $115. Through Northwest Airlines Credit Union, (now Wings Financial CU) we were able to obtain a corporate room rate at the Holiday Inn for $38 a night for conference attendees. We sent out brochures to all credit unions over $100 million in assets and engaged speakers through various referrals. A cruise on the St. Croix River was added at the last minute as a social event for attendees. To our astonishment, we had 75 participants. The conference had great speakers and received high marks by participants. We were elated and congratulated ourselves for a well-received first conference. Early services for our members included publishing The Audit Report newsletter, development of audit programs, planning for annual conferences, creation of an information package for new internal audit departments, production of a membership directory, and establishment of regional directors and meetings. In 1991 membership jumped to 102 and has risen steadily through the years. Today, ACUIA has more than 800 members in the United States and Canada. · unify and encourage cooperative relationships among credit union internal auditors to facilitate the exchange of information and ideas. · promote professional standards for internal auditors in credit unions. · provide educational opportunities for developing and enhancing audit and leadership skills. · provide guidance for internal auditing of credit unions. · assist in the development and retention of internal audit functions at credit unions. · promote the IA profession in the CU industry. The credit union industry is founded on volunteerism and the principle of 'People Helping People'. This is a true reflection of why the Association of Credit Union Internal Auditors was created. 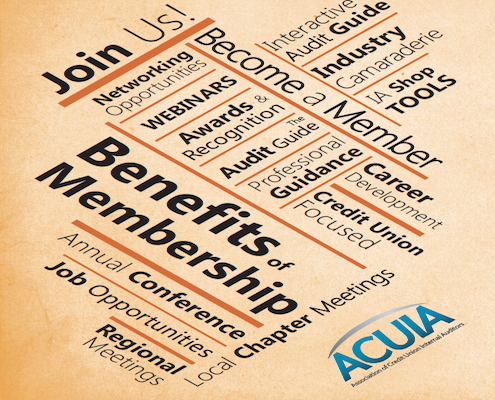 The ACUIA is dedicated to the professional practice of internal auditing in credit unions."